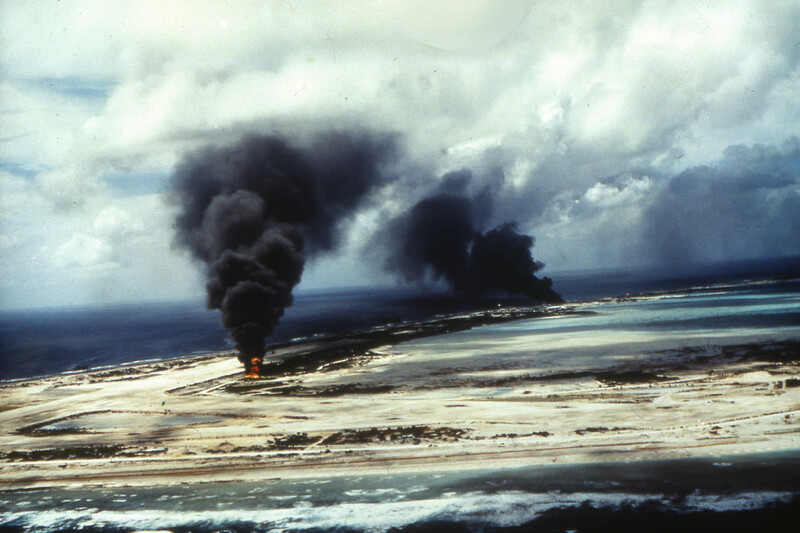 Smoke rises over Wake Atoll after a U.S. Navy raid against the Japanese garrison there in 1944. 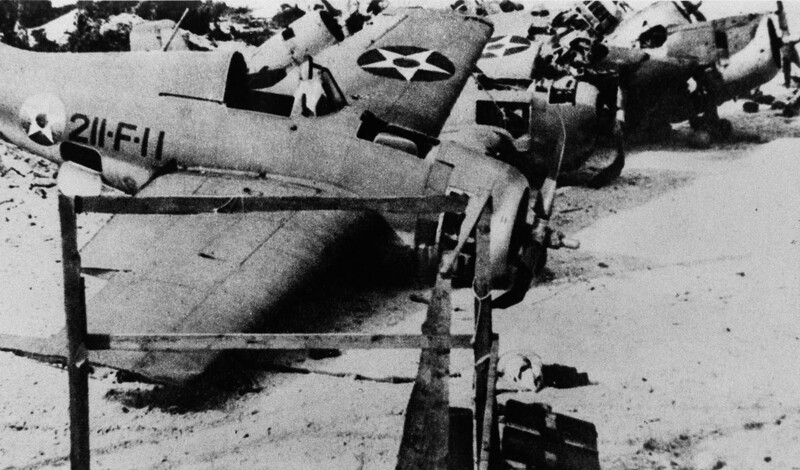 The wrecked remains of VMF-211’s F4F Wildcats. VMF-211’s epic, outnumbered campaign against the Japanese earned it distinction, and after the last of the Wildcats was destroyed, the pilots served as infantry and fought on the beaches of Wake during the final invasion on December 23, 1941. December 11, 1941, the USMC, Navy and civilian construction workers on Wake Atoll held off a Japanese amphibious landing attempt in what became the Pacific War’s only successful defense against such an assault. Wake held out for another two weeks until the Japanese effected a night landing and got ashore in force. 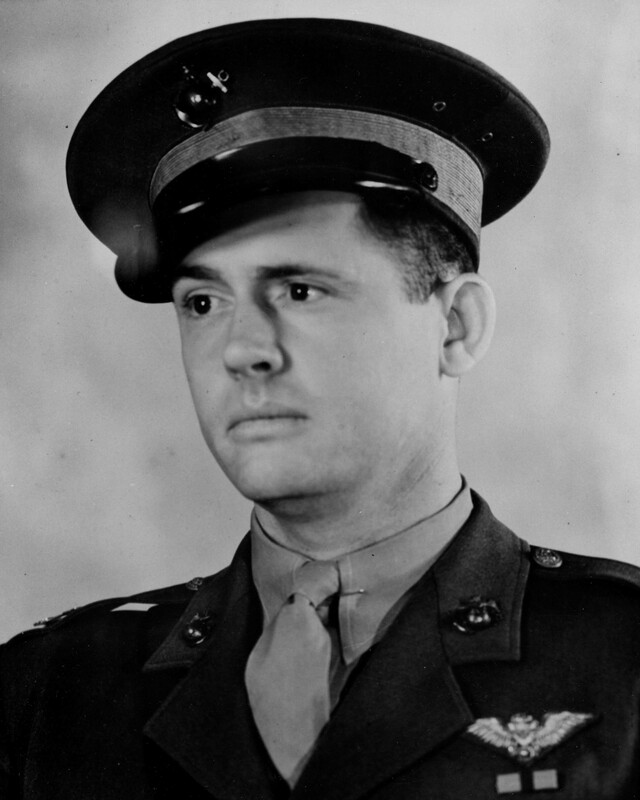 Henry “Hank” Elrod, one of VMF-211’s F4F pilots, earned the Marine Corps’ first Medal of Honor for an aviator during WWII. He was credited with sinking a Japanese warship on December 11, 1941, then later fought as infantry during the night amphibious landing on Wake. He was killed in action during the fight on one of the landing beaches. The garrison surrendered on December 23, 1941 after having inflicting between 700-1,000 casualties on the Japanese. The defenders also sank two destroyers, two transports and a submarine during their desperate stand in the Central Pacific. The December 11, 1941 victory galvanized a dispirited American home front and led to considerable press. “Remember Wake Island,” became a propaganda slogan for months after the atoll’s surrender.